It had to be done. No explanation is needed. It's just time to find a new and healthier passion. Thank you for visiting and reading this blog, whether it's everyday, once a week, or only rarely. Happy Halloween, Happy Thanksgiving, Merry Christmas, Happy Hanukkah, Happy New Year, Happy Everything. The two biggest benefactors of ISIS terrorists shake hands. The West's two key allies in the Middle East are the region's biggest violators of the laws of war: Saudi Arabia and Turkey. Both Yemen and southeastern Turkey have endured brutal attacks from two larger, more powerful, and wealthier states. The official claims from both capitals in their propaganda wars on their neighbours rest on the big lie that they are defending themselves from terrorism. But the resistance activities of the Houthis and the PKK do not constitute terrorism. They only target the police, military, and other institutions of the state. The Saudi Arabian government and the Turkish government are the real terrorists because they target civilians as a matter of government policy. The fact that more than half of Yemen is on the brink of famine shows that the Saudi strategy to win back influence in Yemen is principally directed at the civilian population. Maybe they think the less people there are to rule over then the easier it is to rule, but they would be wrong in thinking that. What will they achieve by implementing a policy of mass famine on the Yemenis? Victory? That's not victory. That is just killing on a mass scale. The Saudis are building a mountain of bones in Yemen because they're too weak, immoral, and stupid to devise a winning political and military strategy. Turkish and Saudi leaders believe waging a collective war against Shiites and Kurds is in their long-term security and geopolitical interests. But which country in the world wants to support their racism and sectarianism in an open public forum? Israel? America? England? Russia? China? None of them do. They falsely believe that America and the Western powers are in their corner because of their shared history as Cold War allies, their strategic location, and their ability to inflict harm against the West. Saddam thought that once too and then he got stabbed in the back by his American and Western backers when he invaded Kuwait after being promised by Bush that there would be no consequences. The simple rule of thumb is things change so it's never a good idea to piss off your nearest neighbours. The peoples of the region won't live in a state of peace, without the threat of ISIS at their throats, until both Ankara and Riyadh face serious consequences for their support for ISIS terrorism. States that support terrorists have to pay a price or else they will continue doing it. Western sanctions, like the ones put upon Iraq, Iran, and Syria, are obviously not in the cards, but why should they be? It is not the West's job to punish every bad actor in the world. And international condemnations of Saudi and Turkish behaviour against their neighbours is not enough. Muslims themselves have to take care of the crimimal monarchy of Saudi Arabia and check Erdogan's rotten ambitions. Arming the Houthis and the PKK should be the obvious first step. Both groups have their ideological and political flaws, but at least they're not causing famine, leveling cities to the ground, and blowing up mass funerals. If nothing is done to challenge the crimes and transgressions of Saudi Arabia and Turkey then the region will continue to suffer the blows of Jihadist terrorism from the Mediterranean to the Hindu Kush. And to look to Washington, Moscow, or Brussels for leadership in the war against terrorism has already proven to be a big mistake. 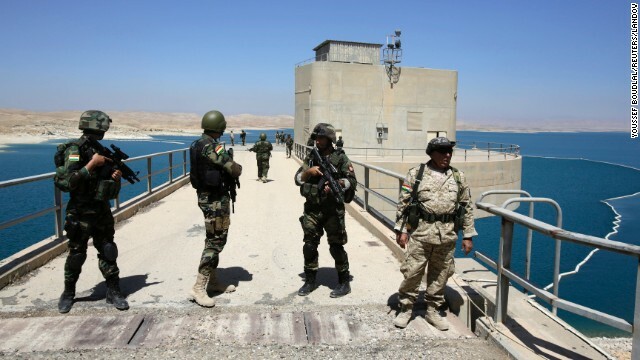 Italian troops guarding Iraq's Mosul Dam are in danger after a "specific and detailed" warning of an attack by ISIS militants, the Wikilao site said Wednesday, saying the troops were on maximum alert. It said the attack would be "the biggest attack ever conceived by the Caliphate" in Iraq. While there has been no "proclamation" of the impending attack, as is ISIS's practice, Wikilao said there was not a single attack planned but "a large-scale assault that they have been working on for months." It said "the machine for the operation has started rolling" even though the preparations were being conducted in high secrecy to maximise the surprise effect. The battle for Mosul is the most important of the two-year campaign against the Islamic State in Iraq. Judy Woodruff speaks with retired Gen. David Petraeus, former commander of the Multi-National Force Iraq, about the current combat mission, as well as what he says is the greater challenge of governance of the region after ISIS has been dislodged. Iraqi and Kurdish forces have continued to close in on the last major stronghold of Islamic State in Iraq. 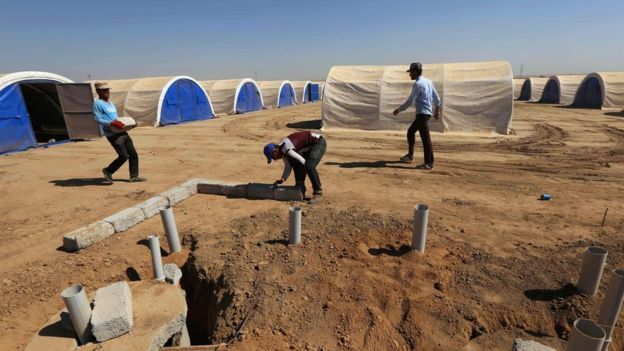 The offensive supported by coalition airstrikes, began on Monday. Today, Kurdish forces opened up a new front in villages north east of Mosul like the strategically important Bashiqa - where fighting continues, while Iraqi forces attacked Bartella around six miles to the east - on the road between Mosul and Irbil - the Kurdish capital. They're also pushing north towards Hammam al- Alil. After ISIS, the world is anxious about what will come next for the people of Mosul. Michelle Powers sat down with Ed Clancy, a director from Aid to the Church in Need, who has worked directly with Christians on the front-lines. Trump told the truth about the politicized timing of the battle for Mosul. Only an idiot thinks politics didn't have anything to do with the plan to liberate Mosul at this point in time. The sad truth is that Mosul didn't need to be liberated if it had been protected more willfully. The Iraqis, the Americans, the Saudis, and the Barzani-led Kurdish government ceded Iraqi territory to ISIS on purpose. They sacrificed the Ezidis to them on that mountain. Not a fan of ISIS, but the Iraqis and the "coalition" don't deserve to win this war, not after that shameful deed. Now they're letting top ISIS commanders who committed crimes to escape into Syria. Another shameful deed. Iraqi leaders of all sects and ethnicities have no shame. Iraq will be in a state of war and degradation for the foreseeable future because it has no true leaders. They have self-interested tribal chiefs, corrupt politicians who steal from the public, and religious preachers greedy for power, but not a strong leader. It will be under the influence of the Americans, Turks, Saudis, and Iranians for a long time. Some of the foolish citizens of Mosul who cheered when ISIS took their city falsely believed that ISIS was their saviour, that ISIS would take the fight to the Shiites and Iran who they irrationally feel humiliated by, but they have since learned that ISIS came to destroy and control them. ISIS were literally robbers in ski masks wielding machetes, and these idiots invited them into their homes. If you let in an evil snake into your home, don't be surprised that it eventually turns on you. The Sunnis of Iraq and Syria have learned this over the course of the last five years. Turkey will learn this lesson in time. And Pakistan has been in the process of learning it. France is holding a conference on the future of Mosul. The same country that had a hand in screwing up Iraq and the Middle East a century ago is allowed a leading seat at the table to screw it up for another century. These Iraqis, man, they have no self-respect. Only fools don't learn from their history. Iraqis look to Europe for political leadership and America for military leadership, and then they wonder why they can't fix their own local problems. As long as they keep this submissive mindset and allow countries like America and France to handle their affairs then their society will be a mess for the next hundred years. The exodus of the gifted and secular people out of Iraq won't end anytime soon. All the Christians, Ezidis, Jews, and other minorities have already left due to evil Western policies and actions. And they're probably never going back. French Foreign Minister Jean-Marc Ayrault says France will host an international meeting on Thursday on the future of Mosul. The statement comes on the second day of a major offensive to retake Iraq's second city from ISIL militants. Ayrault said the coalition must plan for the stabilization of Mosul after the military battle, adding that Iran, which wields substantial influence in Iraq, was not invited to the talks.